It was in the year 1991, when the Philippines was again placed in the headlines all over the world. At that time, it was an unfortunate event which devastated millions worth of properties, left thousands of familes homeless and unexpectedly decreased the number of our populace, specifically the Aetas, one of the indigenous communities in the country. This was the Mt. Pinatubo volcanic eruption, whose previous eruption was estimated to be 400 years ago. From the said eruption, a crater lake was formed, which now turned out to be one of the most visited tourist attractions in the country. 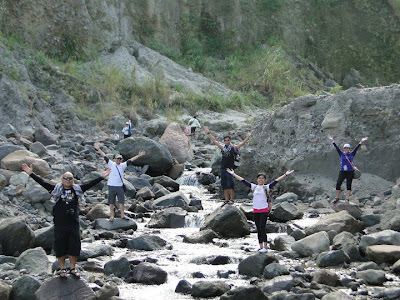 Exemplifying a Filipino trait, the said unfortunate event was used by the Filipinos to venture into a promising opportunity, that is, the development of eco-tourism in the country. I have always wanted to witness the natural beauty of Mt. Pinatubo crater lake but not too soon., after all this is about trekking. Though I am not into mountain climbing and trekking, this activity seems to be unconsciously part of my system. When the year 2011 came, I had no plans of including it in my list of destinations nor was it forecasted. While browsing over a social network site (Facebook), a friend of mine from Tacloban City left a message inviting me to join them in their Pinatubo adventure. Since she was the organizer, all I have to do is to be physically present on that scheduled day. Without any hesitation, I heeded and even invited other friends as well. Thus, the discovery of the Mt. 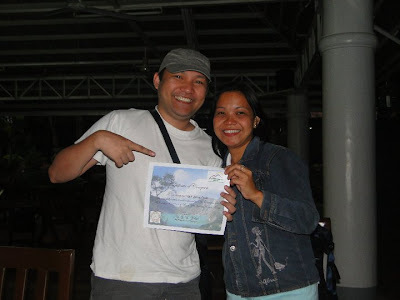 Pinatubo crater lake marked the finale of my January 2011 adventure. January 31, 2011 at 3 in the morning - we were bound to Brgy. Sta. 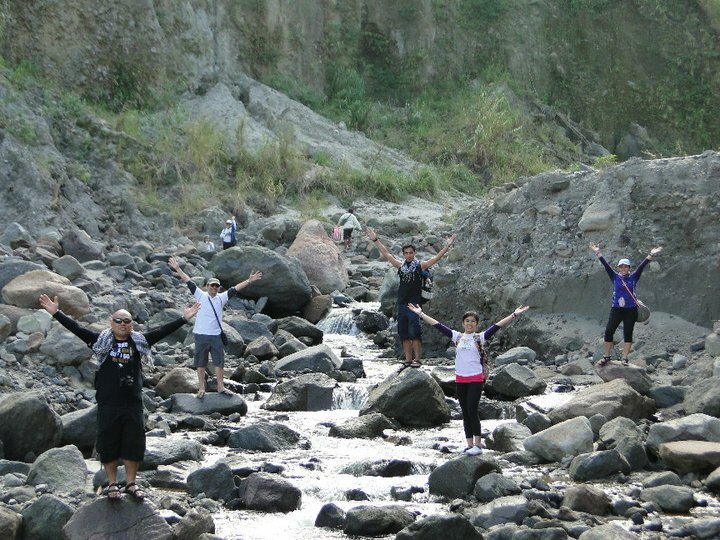 Juliana, Capas, Tarlac, the jump-off point of our discovery. It was a 2 hour ride to Tarlac. We stopped by at McDonalds-Capas, Tarlac for breakfast while we waited for the tour manager from Pinatubo Spa to take us to the Spa itself for registration. My other friends rode the rented van to Pinatubo Spa while we opted for a private car. Parking spaces are available infront of the Pinatubo Spa, so no need to worry for those who wanted to bring their private vehicles for comfort and convenience. It was a 30-minute ride from McDonalds, Capas Tarlac to Pinatubo Spa. After registration at the Spa, the adventure then begun. 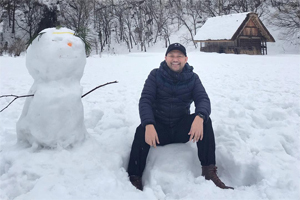 The discovery begun on a four-wheel adventure drive. It was a bumpy yet thrilling ride. The usual trip takes an hour to the foot of the mountain where the trekking starts, however, with our very skilled driver, it took less than that. On board the 4x4 vehicle, expect a lot of breath taking views and a feeling of excitement as to what lies behind the mountains. There are two options of disembarkation to trek towards the Mt. Pinatubo crater lake, which is either the short or the long way. The short way is what they call the skyway, extended 4x4 trip and less trekking. We opted for the long way - the two hour trek. It is advisable to go in groups of five as the capacity of the 4x4 vehicle is 5 persons, excluding the guide and driver. After the 4x4 adventure, we are now set for the two-hour trekking. 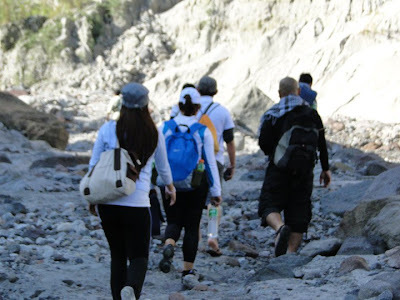 The trail was not that easy...stepping on rivers, passed by sulfuric rocks, felt both the hot and cold waters of the rivers, stepped on the sand and various rock formations created by the flow of lahar in that fateful 1991 eruption under the scorching sun. As a reminder, wear the most comfortable hiking clothes and footwear that you have. This is not about how you would look on pictures but on how convenient the trail will be on your part. I recommend you wear sandals or slippers, whichever you will be comfortable if you will opt for the 2-hour trekking, as you will pass by rivers. After the hours of trekking, you will be greeted by the sign below. Trekking will start here? So what were we doing for the past hour? And so the trek continues. The following signs will be visible during the trail. Then the majestic view will appear in less than 20 minutes, which makes us not senior citizens...right? Packed lunch is included in our tour, and so it's now time to relax. We had our lunch at the crater lake. 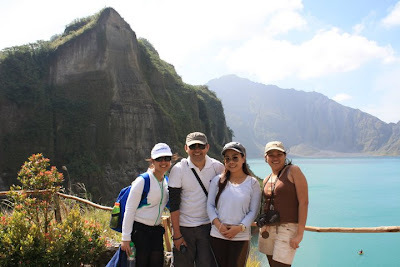 Finally, the discovery of the Mount Pinatubo crater lake. Then, the close encounter with the crater lake. The depth of the crater lake is uncertain. Boats are available for rent at 350.00 pesos per head with life vest if you want to traverse the lake and the other side of the lake offers a hot spring as a treat. As for our group, we opted to take a nap at one of the cottages near the crater lake. It was lunch time so sun bathing or at least burning ourselves under the scorching heat of the sun is never an option. There were foreigners swimming and others getting themselves a new skin color near the crater lake. Thanks to Ms. Mallari from the Pinatubo Spa for the adventure and to Ms. Regina "Lader" Derla for organizing the event. 0300 Assembly at Cubao Victory Liner Terminal. Depart from Manila. - volcanic mud pool: 500.00 pesos per head 30 minutes treatment to stretch your skin and make you look more younger.